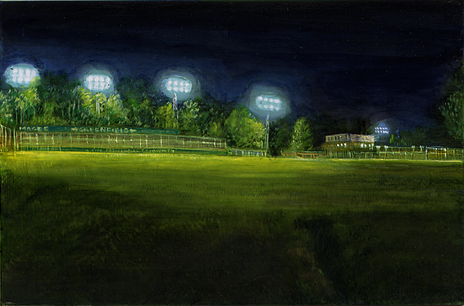 Magee Field appears in this month’s issue of Harper’s Magazine. 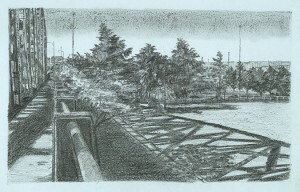 Subscribers can see the page online here. 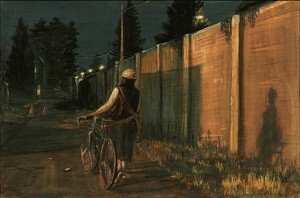 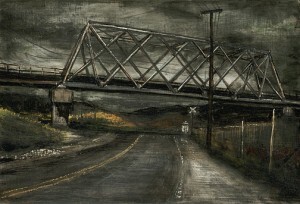 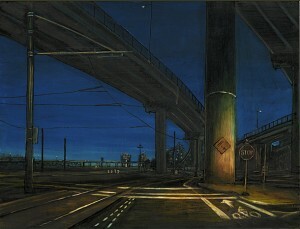 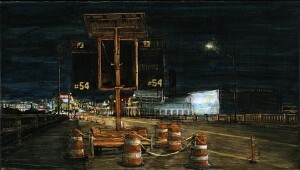 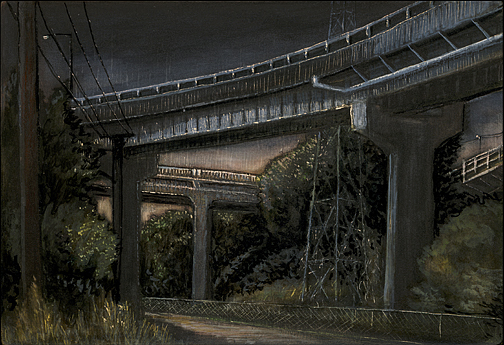 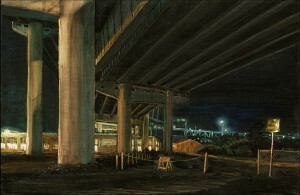 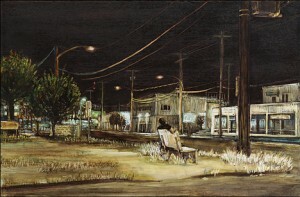 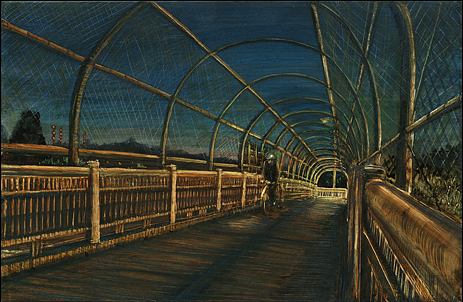 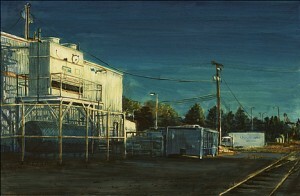 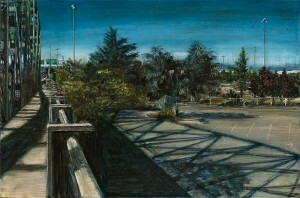 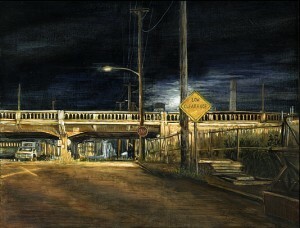 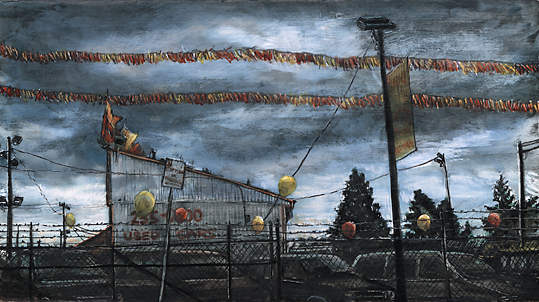 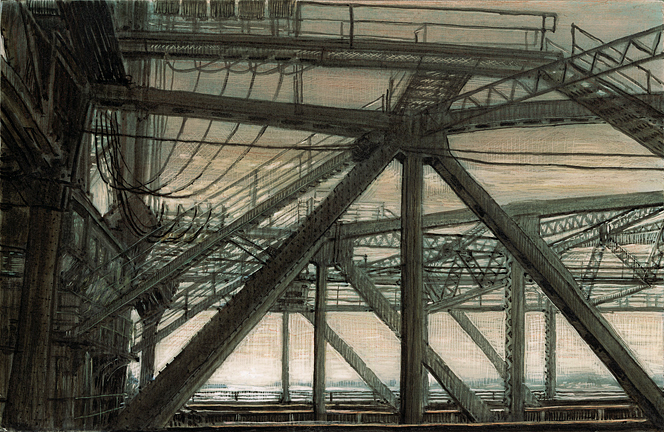 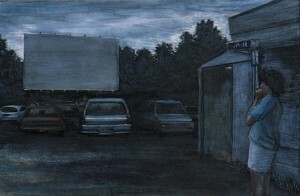 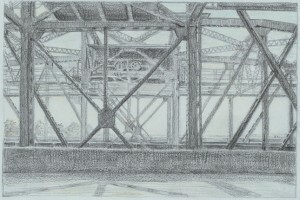 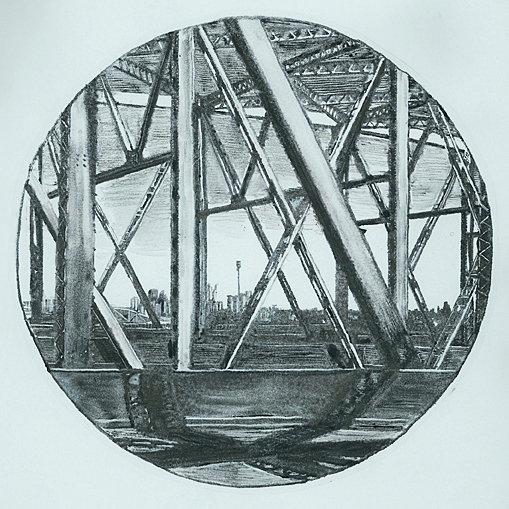 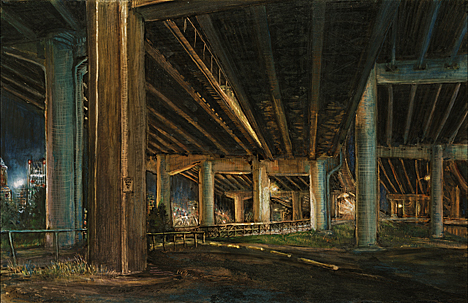 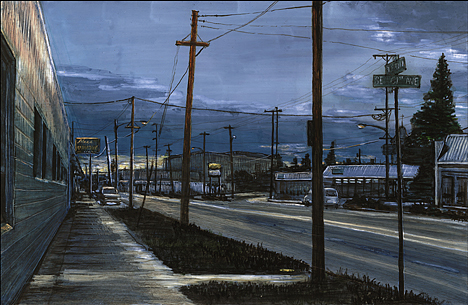 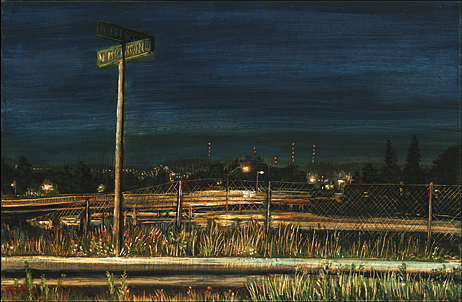 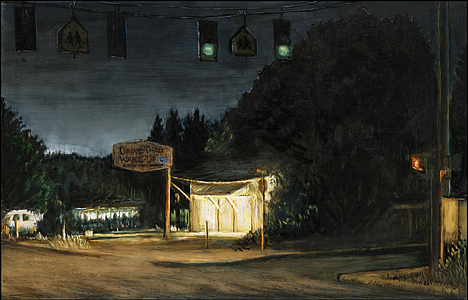 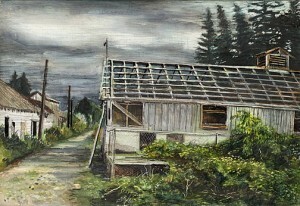 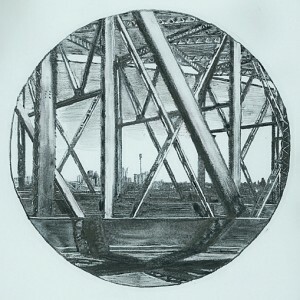 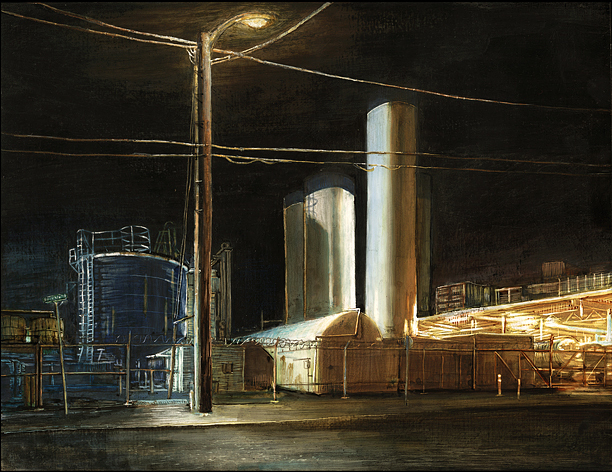 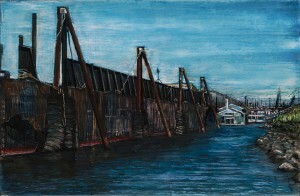 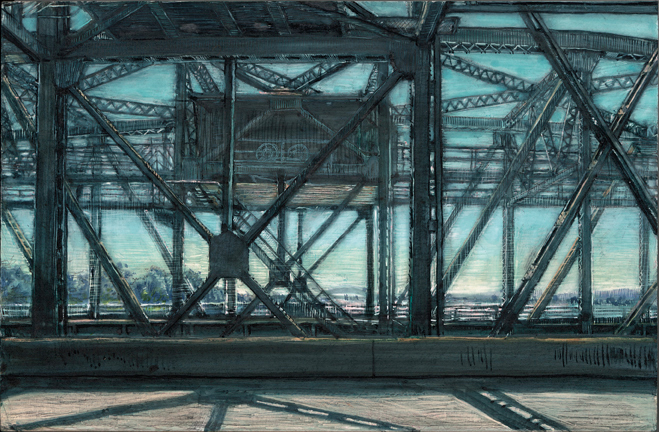 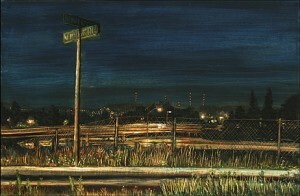 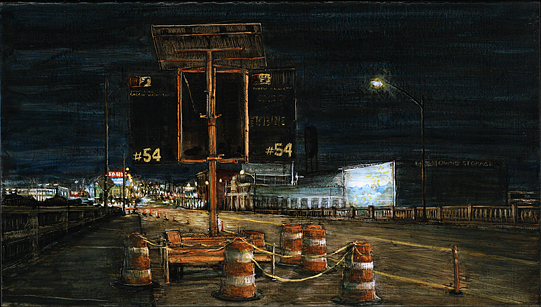 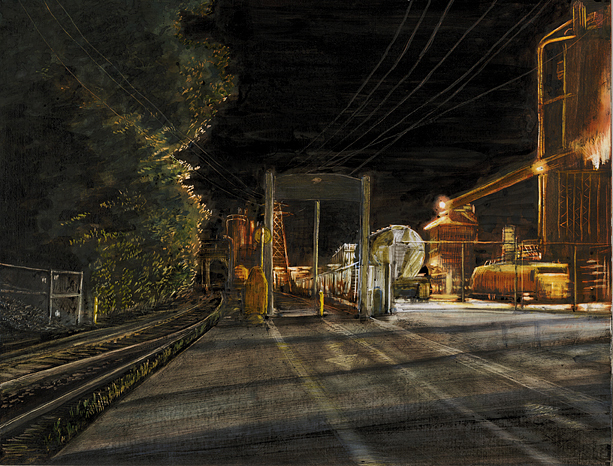 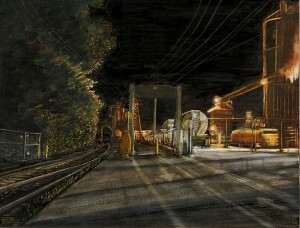 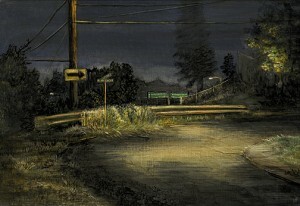 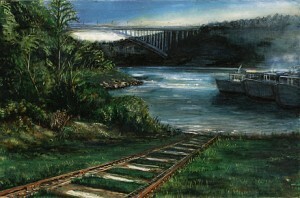 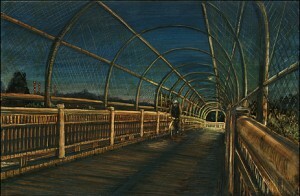 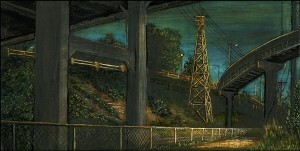 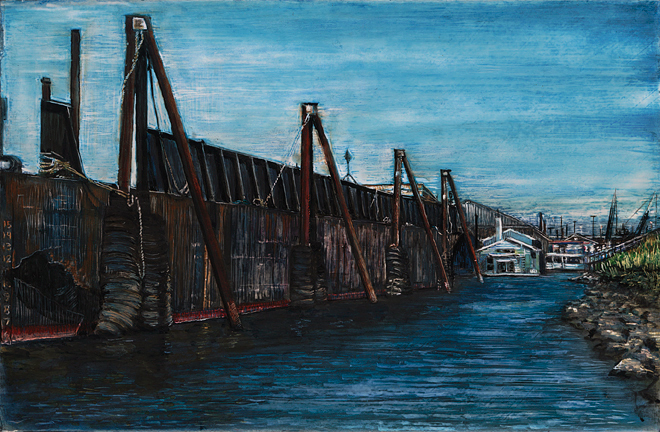 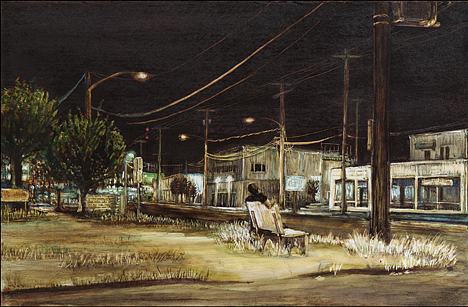 Each work, even those set in daylight, seems caught at a midnight hour that will stay eternal…On one level, Wilburn is interested in documenting the life of the bridge, but on another, she merely uses the bridge as a shifting metaphor, an embodiment of life’s varied, mundane and limitless activity. 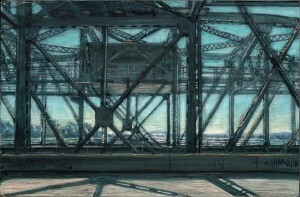 In order to unify a show of work done in a variety of media, I focused on a very specific part of the Portland landscape: during my most recent visit to Portland, I spent many days walking over and around the Interstate Bridge. 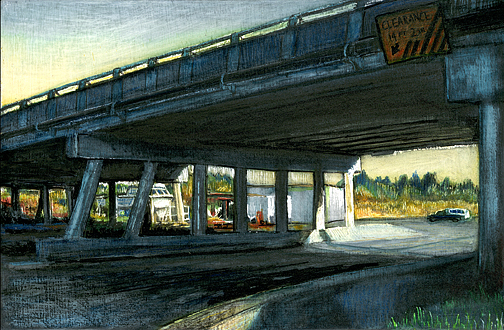 On summer mornings, there’s a marked contrast between the visual and tactile experiences of walking across a bridge that is part of an interstate highway: clear skies and crisp shadows and high distant views, traffic noise and constant rough vibration underfoot. 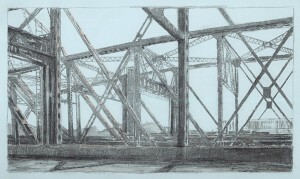 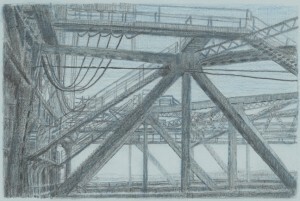 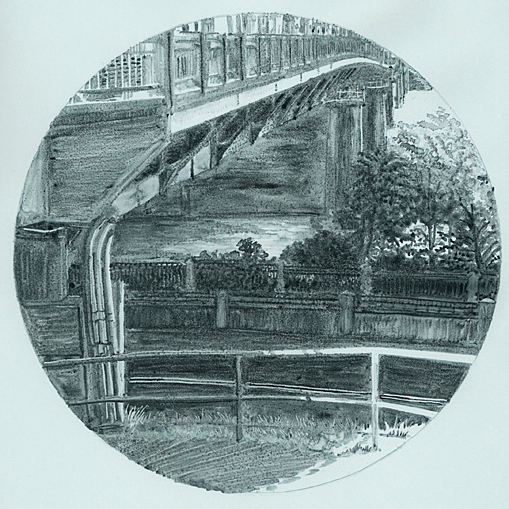 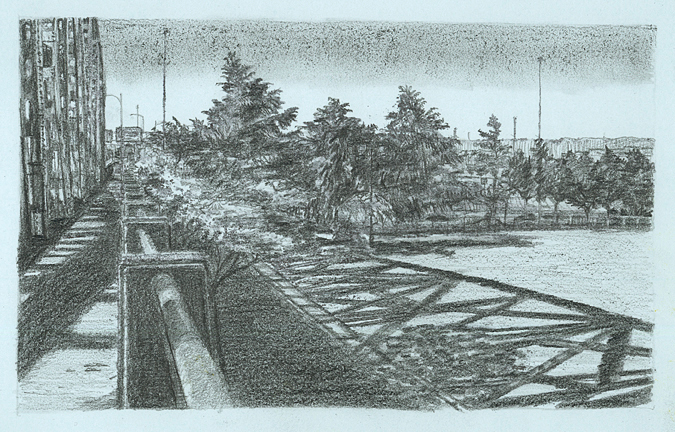 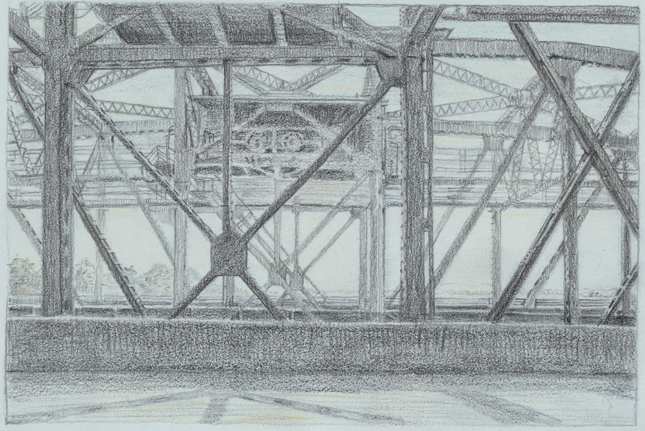 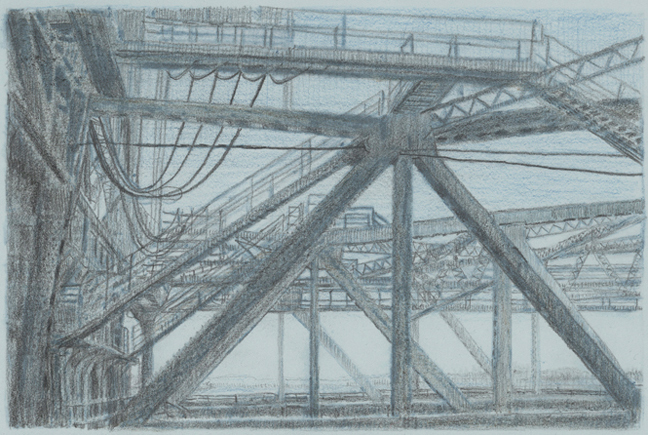 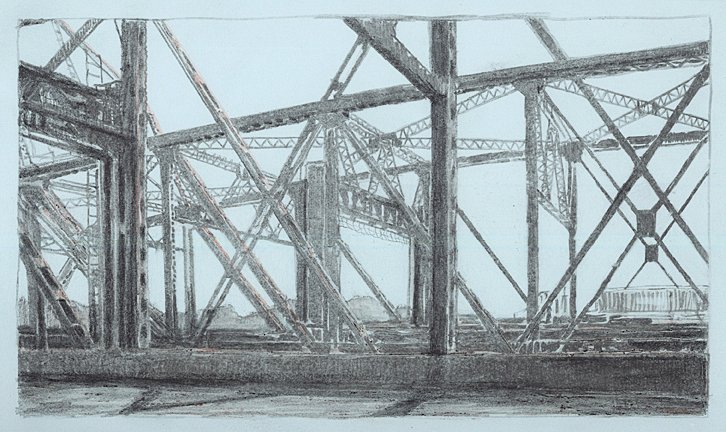 Monoprints and graphite drawings on blue paper, largely monochromatic and low-contrast, are a venture into a different medium and also serve as studies focusing on the structural elements of the bridge. 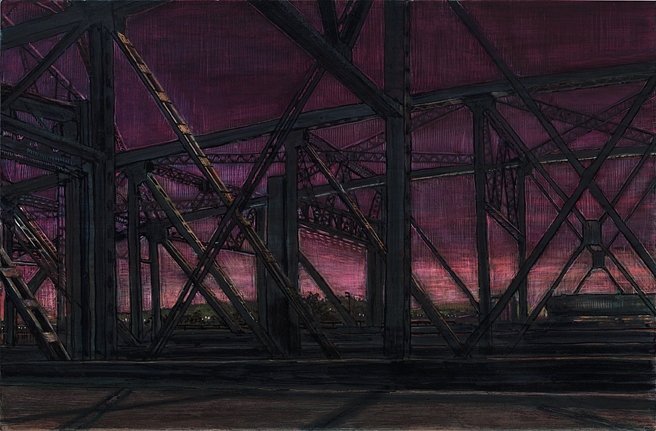 I let the resulting geometry and texture in the bridge studies suggest the color and mood of the sky and landscapes in the dye paintings. 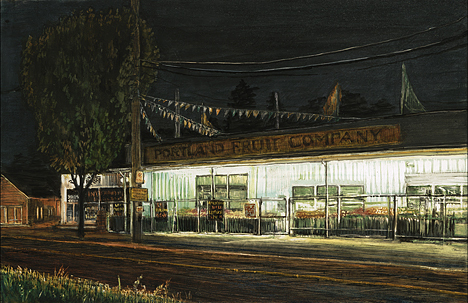 For the past ten years certain locations in Portland, and certain structural and natural elements in the landscape, have held my attention. 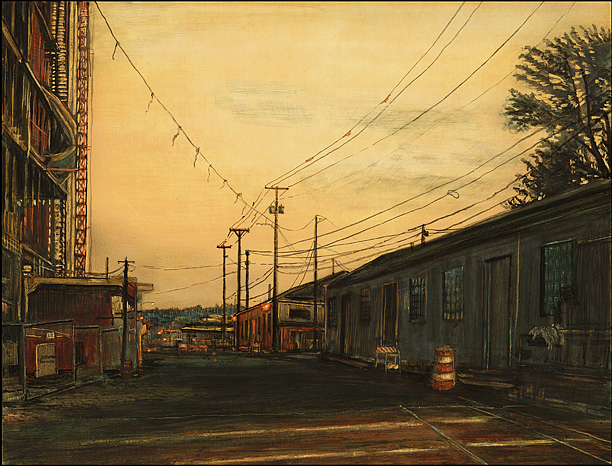 During this summer I returned to several of those locations, including industrial Southeast, the unfinished ground of the south waterfront, and those corners, out in back of the new shops and restaurants, where North Portland still kisses the interstate. 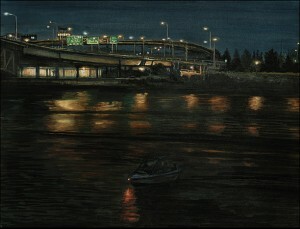 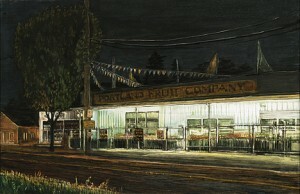 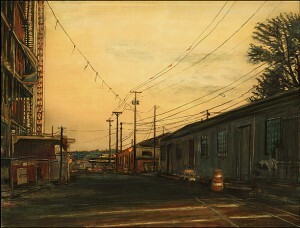 In those places, massive concrete curves, streetlights and wires, rivers and their bridges, fennel and blackberry plants- elements that, though not exclusive to Portland, are emblematic of the Portland cityscape – combine with the shifts in hue and texture that mark the Northwestern night sky’s transition from summer to fall. 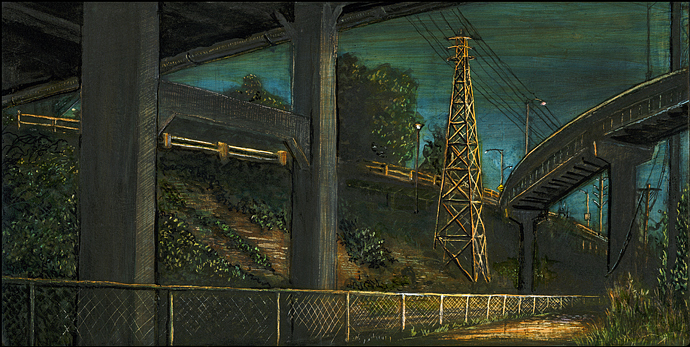 A third of the paintings were started on location: the rest were painted from the summer’s sketches and photographs in my Pittsburgh studio. 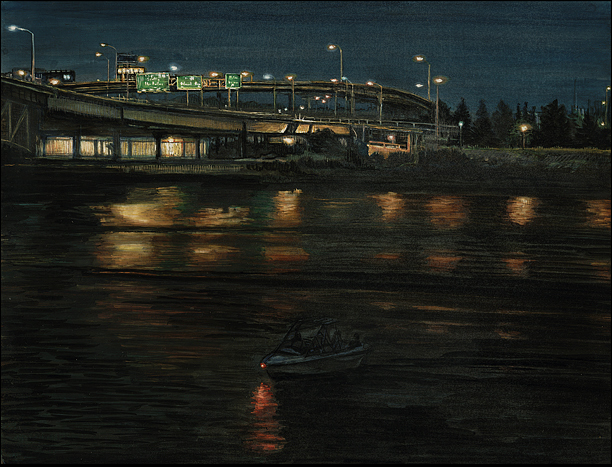 Each morning, surrounded by images of bridges and viaducts and power lines, I watched ODOT cameras refresh the still-dark sky over I-5, and painted as the season changed in two cities, three time zones apart.